Webroot SecureAnywhere Internet Security Plus and F-Secure Total are both premium security suites offering a range of features and great malware protection. SO if you are choosing between these two packages, check this article out. Webroot SecureAnywhere Internet Security Plus is developed by Webroot International Limited. The company was founded in 1997 in Colorado, USA. The company’s smart cybersecurity solutions and cloud-based protection are well known by home users and businesses worldwide. Webroot provides home users with security software for PCs, Mac computers, and mobile devices. If you are looking for reliable protection for your Windows PC, Webroot SecureAnywhere offers users three types of packages, including Webroot SecureAnywhere AntiVirus, Webroot SecureAnywhere Internet Security Plus, and Webroot SecureAnywhere Internet Security Complete. Webroot Secure Anywhere Internet Security Plus starts at $59.99 per year for three devices. Unlike F-Secure that combines malware signature-detection and heuristic monitoring in order to catch malware, Webroot SecureAnywhere works on metadata and behavior patterns. In addition, all suspicious icons are sent to Webroot’s cloud-based service for further examination. When it comes to web protection, Webroot SecureAnywhere Internet Security Plus also includes browser extension that supports Google Chrome, Internet Explorer, Microsoft Edge, Mozilla Firefox, Safari, and Opera. It is worth to mention that Webroot scours 95% of the Internet three times a day. 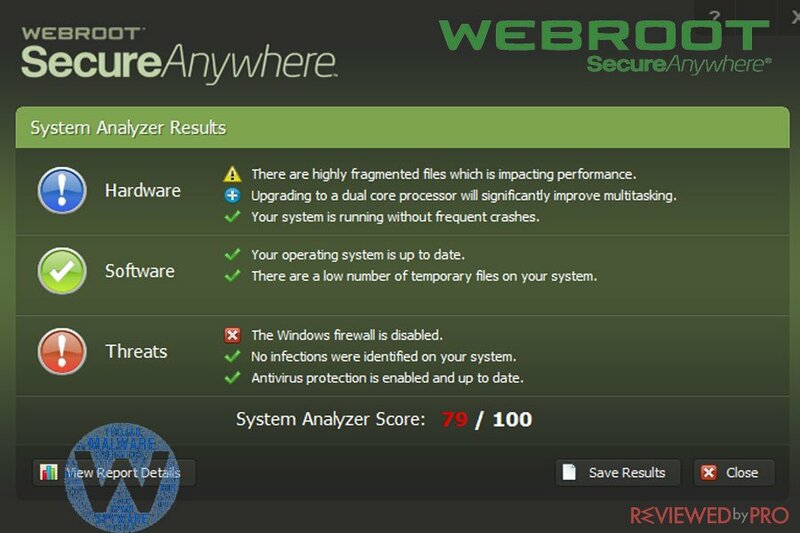 When it comes to the test results, Webroot SecureAnywhere Internet Security Plus demonstrated excellent antivirus protection, as it managed to catch all malware samples on the test computer. Webroot SecureAnywhere Internet Security Plus provides users a relatively decent set of extra security and privacy features. Identity-theft protection features protect usernames, passwords, and other private data; password manager encrypts credit card credentials and other important data; webcam protection protects users against threats that aim to hijack their webcam. In addition, the package comes with mobile security software. However, the package does not include parental controls, backup software or VPN service. When it comes to system-performance impact, the software is very light on system resources consumption and is one of the smallest applications in the market. The scans are also quick and do not slow down a system. Webroot SecureAnywhere offers a very simple and easy to use interface as all the features are accessible in the main window. 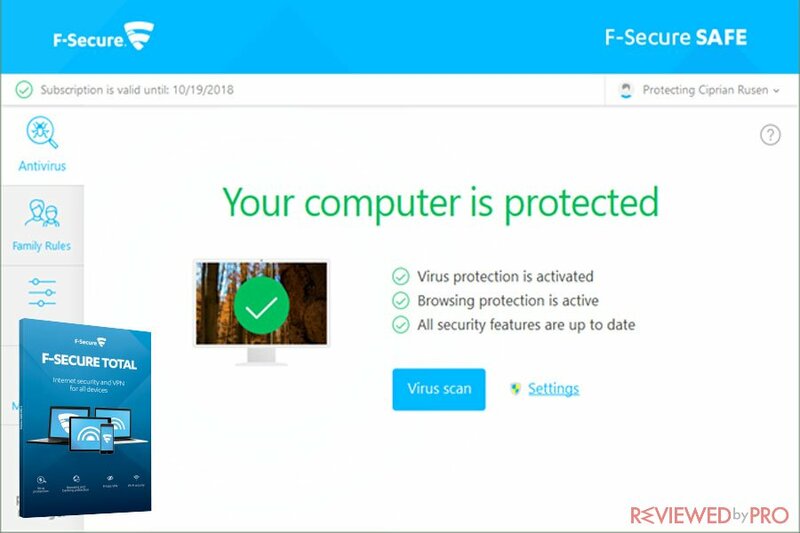 According to Reviewed by Pro, the antivirus software is great for those, who do not require features such as parental controls or spam filtering. Webroot SecureAnywhere Internet Security Plus is a small, quick application that does not consume much system’s resources. It also delivers a very decent protection against malware, ransomware and other cyber threats, protects users’ privacy and offers anti-theft features. It comes in a bundle of Windows PCs, Macs, and Android devices for a very reliable price. However, it does not offer parental controls or spam filtering. F-Secure Total offers Internet security software and VPN service for all devices. The package was developed by a Finish-based cybersecurity company F-Secure. The company was founded in 1988. Today F-Secure is one of the largest companies operating the security software industry and offers its customers antivirus, password management, endpoint security, and other security and antivirus software for home users and businesses. F-Secure offers a range of Windows security products, including F-Secure Total, F-Secure Safe, and Freedome VPN. F-Secure Total is compatible will all devices, including Macs, and Androids. It starts at $9.99 per month or about $100 per year for five devices. Users who want to try the software for free can get a 30-day trial which does not obligate to purchase the product. F-Secure combines a traditional signature matching engine that searches for known widespread malware and behavioral monitoring called DeepGuard, which detects suspicious behaviors and programs. Finally, all suspicious icons are sent to F-Secure’s cloud-based servers for further analysis. When it comes to secure web browsing, F-Secure also protects users while shopping, banking or simply browsing the web. Even though F-Secure Total provides nearly excellent malware protection, it delivers a number of annoying false positives. F-Secure Total provides users a very decent security and privacy feature set, including anti-spam features, game mode, browser extensions, hardened, secured browser, network scanner, parental controls, web management portal and a VPN service. Compared to other antivirus applications, F-Secure has a high impact on system performance and uses a chunk of system resources. The program had a system-performance hit by 16% while working in a background. Scans are relatively fast but have a heavy performance hit (about 60%). F-Secure’s interface is very simple and easy to use. The design is bright and white with light-blue and dark-blue details. The main window enables users to perform an immediate scan and all options are easily accessible. If you want to access your F-Secure account, you will need to visit my-f-secure.com, because you cannot access it from the interface. F-Secure Total is a great solution, however, it lacks some features and has a high system-performance hit. F-Secure Total is a very reliable antivirus solution which delivers advanced antivirus protection. The package also includes a VPN service and protects users’ privacy. However, it lacks some other additional features, other security applications offer, such as backup software, online storage or anti-theft features. F-Secure Total also has a heavy impact on a system and slows down computer performances. Webroot SecureAnywhere Internet Security Plus is a great solution for those who do not require parental controls or more additional security and privacy features. Webroot is a very lightweight software that offers one of the fastest scannings in the market. It also has an excellent antivirus protection and retails at a very reasonable price. 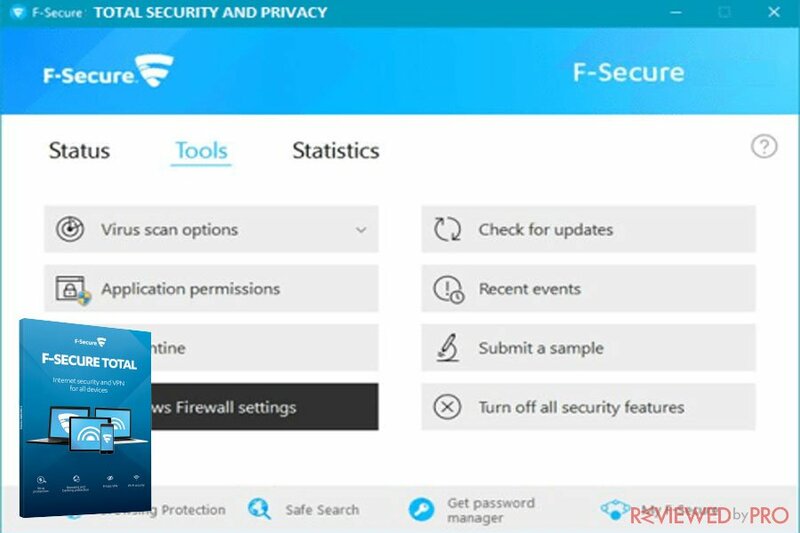 However, if you are looking for a security solution for an entire family that would include parental controls, a VPN service and more features than F-Secure Total would be just right for you. ^ Webroot SecureAnywhere Internet Security Plus. Webroot. 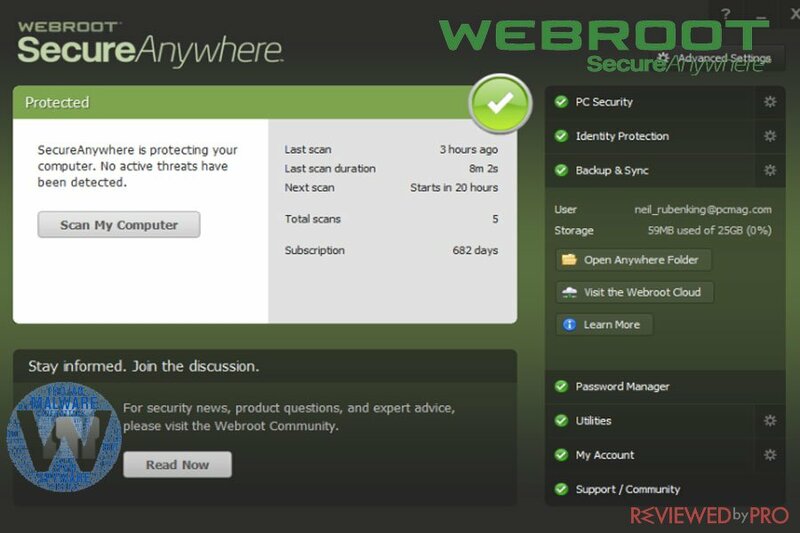 ^ Webroot SecureAnywhere Internet Security Plus Review. Reviewed by Pro. 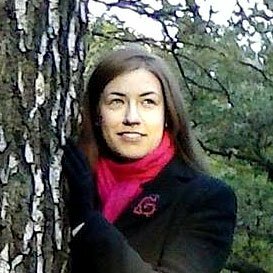 ^ F-Secure Total Review. Reviewed by Pro. This entry was posted on 2018-04-26 at 07:39 and is filed under Security.